Wunghnu Primary School was established in 1877. It is situated 8km south of Numurkah and 25km from Shepparton. The school is uniquely situated on the banks of the Nine Mile Creek and beside a beautiful nature reserve. The school playground is expansive and features two adventure playgrounds, sandpit and wooden fort, rebound wall, sporting oval and multipurpose court. 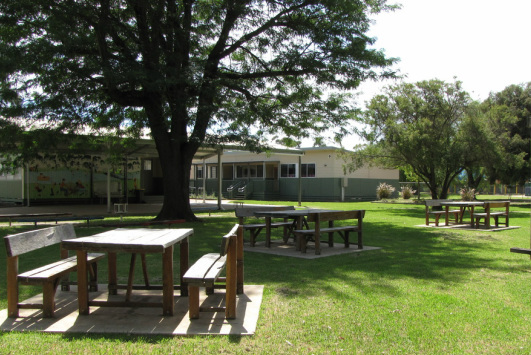 Wunghnu Primary might be a small school but we have a lot to offer, the school has two large modern classrooms and a large multipurpose room currently used for weekly playgroup sessions and developmental play. Students have access to a Polycom unit, iPads and computers, as well as each classroom has an interactive whiteboard. The school is serviced by the MARC (Mobile Area Resource Centre) and MACC (Mobile Art Craft Centre) vans which visit fortnightly and we have visiting Sporting Schools program as well as specialist teachers. The school is serviced by two buses that cover a wide network of roads, enabling families in the surrounding area to transport their children to and from the school. Wunghnu Primary has a strong family atmosphere and therefore we encourage a high level of parent participation in all aspects of school life. We believe that all of us, working together, will achieve the best possible education for your child. Wunghnu Primary School’s small size allows us to provide a team orientated and supportive learning environment where the individual needs of each child are well catered for. Children at Wunghnu Primary are valued, cared for and treated with respect, they happily work together following the Core Values: Be Safe, Be Responsible and Be a Learner. Wunghnu Primary offers a family friendly atmosphere in which children are encouraged to strive for excellence. The school operates under the premise that every child receives every opportunity for the best education. Being a smaller school receive lots of individual attention and all of them get the opportunity to develop leadership skills.